It would have been perfect were it not for the unexpected crunch of eggshell. I'll blame it on the four-year-old. 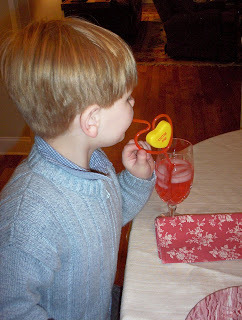 One heart-shaped straw, ten cents. 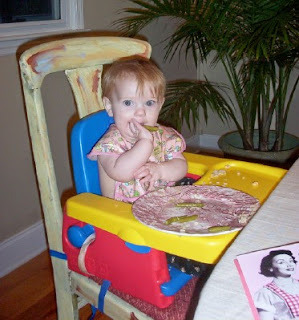 One baby enjoying her first table food, especially green beans flavored with ham. One table ready for a delicious shrimp etouffee from the Puffy Muffin cookbook. It was good. Really good. Note the cute card from my husband. Wonder why that image appealed to him? 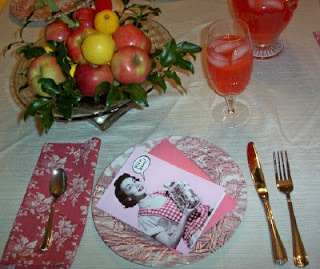 Oooh, I am loving your plates and pretty napkins!! And hey, the Code Red Mt. 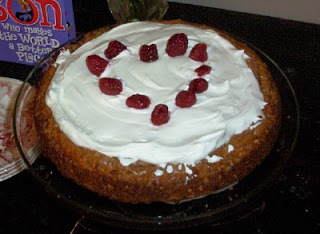 Dew is perfect for Valentine's Day!! Looks great, Meredith. How was the etouffe? I got the PM cookbook for Christmas and LOVE it! The recipes are a lot easier than I was expecting and I know the dishes taste great. I love that place...my mouth is watering right now! What a lovely Valentine's evening you must have had. Everything looks nice! LOVE the cake and table setting!! Also, Andrew set the table...hence the mixed up flatware!